Gideon Milling, a stone ground milling company in the Western Cape, was launched in 2013 by a group of entrepreneurs to improve farmers’ profitability and food security. Aubrey Terblanche and Jurianne Schreuder spoke to Glenneis Kriel about the company’s vision and success. The factory’s power supply is set up to allow for further expansion. When Aubrey Terblanche, a commercial pilot, learnt about his farmer friends’ struggle to make profits in the wheat market, he began thinking of ways to improve their situation. Much discussion and planning followed, which eventually led to the establishment of Gideon Milling in Belville in the Western Cape, a stone ground milling company with six shareholders. The mill was designed to give the farmers greater involvement in the value chain, while at the same time supplying the market with good-quality, healthy flour at an affordable price. 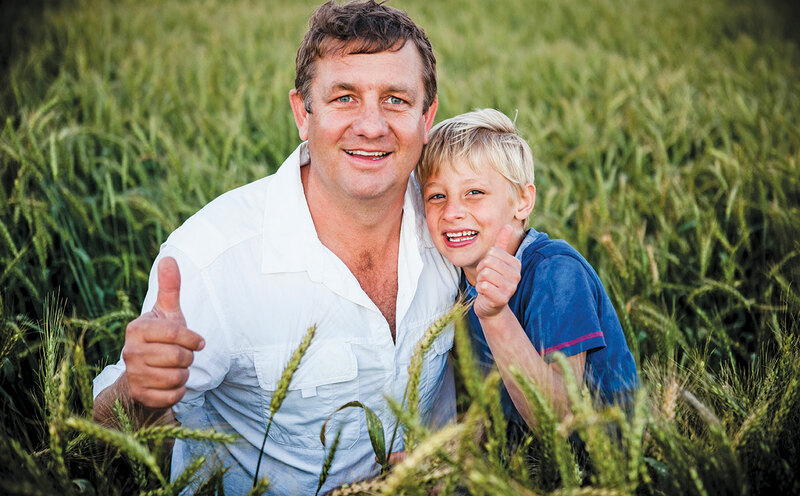 Jurianne Schreuder and his son, Boeta, on one of his wheat lands near Hopefield in the Western Cape. “My vision was to create a situation where neither farmers nor consumers were exploited, as happens so often when agricultural produce gets lost in the value chain. I wanted to enhance food security in South Africa to avoid the kind of Arab Spring situation that broke out in North Africa and the Middle East in 2010 because of exorbitant bread prices,” Terblanche explains. He was motivated by the words of Pastor Martin Niemöller, who after the Second World War wrote the famous poem ‘First They Came’. Jan Hezlett (left) and Aubrey Terblanche. Hezlett aided Gideon Milling’s start-up considerably, thanks to his many years of milling experience. 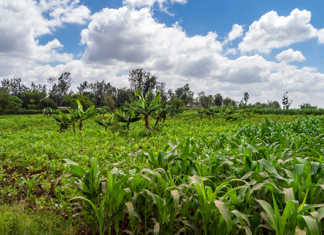 Terblanche says the poem, which deals with the fate of minority groups, made him realise he had to take a stand for farmers and food security. To do this, however, he needed access to the market, which he achieved through establishing the mill. Only two of the company’s shareholders are wheat producers: Jurianne Schreuder in Hopefield and Visagie Boerdery in Porterville. 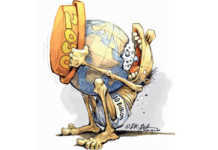 The rest, namely Terblanche, Danie de Wit, André Haasbroek and Johan Orffer, are investors. Terblanche and Schreuder only realised it was a stone mill after it was bought, but this fitted in perfectly with their vision, as stone ground flour is thought to be more nutritionally dense and flavourful than mainstream flour. 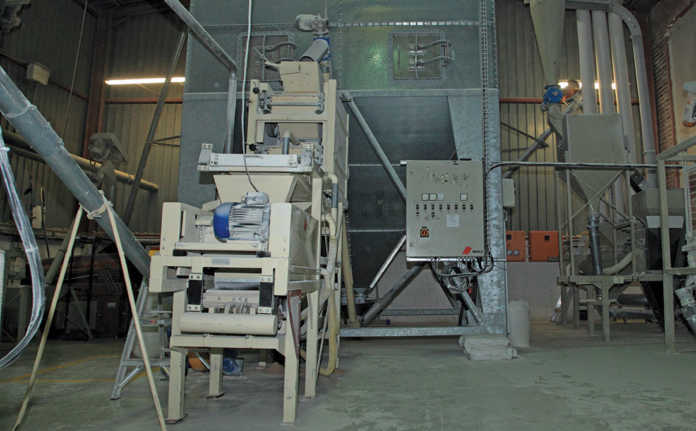 “Flour produced from ordinary mills has to be nutritionally enhanced because of the high temperature used during the milling process,” explains Schreuder. Unlike mainstream mills that import wheat, making it difficult to monitor product integrity, Gideon Milling sources its wheat from farms in the Western Cape that keep accurate records throughout the production process. The origin of their flour is, in effect, 100% traceable from farm to fork. In addition, the company sources wheat only from farms that apply biological and conservation farming practices such as minimum tillage, crop rotation, stubble retention, and the use of manure to build soil health. The mill was finally repaired and set up in Bellville South in 2013. To help with this process, Terblanche managed to obtain the services of a retired engineer, Eric du Preez, who had worked for a big milling company. Du Preez, in turn, recommended the services of a retired miller from Riebeek Kasteel, Jan Hezlett, to get things started. “I think Jan was incredulous when he saw the mill for the first time, but I was adamant that the business would be successful. He saved us a lot of school fees. 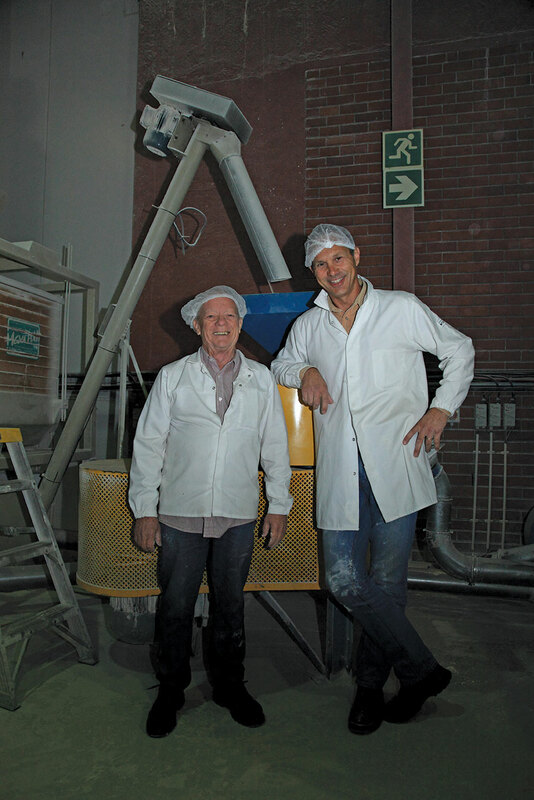 The quality of our flour has been perfect from the very first batch,” Terblanche says. He adds that producing consistent quality is one of the greatest production challenges for a milling company. 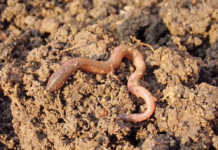 Nonetheless, wheat produced in different regions varies in its characteristics; for example, wheat from the deep alluvial soils of Porterville is different from that grown in the sandy soils of Hopefield. To ensure consistency, Gideon Milling therefore mixes the wheat before milling. The wheat is stored in off-farm silos for a year before it is used; this guarantees traceability and continual supply. “Currently, we have two small silos at Gideon Milling with a capacity of 25t each. 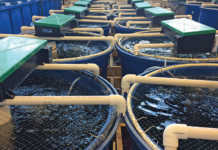 “They are topped up every second day,” Terblanche says. Although he had not realised it initially, the factory has access to a far greater power supply than that presently being used. This will make production expansion easier. Moreover, the factory is on the same grid that serves Consol Glass, and has experienced no load shedding. Gideon Mill employees 18 full-time staff. The manner in which the company obtained market access was fortuitous. “I was scheduled to fly the then chief operating officer of Shoprite Holdings somewhere and took the opportunity to present him with three branded bags of flour while flying back. He liked our story and agreed to give us access to nine outlets and roll out the flour to the Western Cape and later the rest of the country, once we’d proved ourselves,” he recalls. Today, Gideon Milling flour is sold at Shoprite and Checkers stores across the Western Cape, as well as artisanal bakeries and coffee shops. “We’re happy with our deal with Shoprite and Checkers, as you don’t have to wait 120 days for your money. We also like the company’s approach to business. During this past Easter, they gave us the opportunity to supply all their hot cross buns, which we baked at their bakeries. The door to Gauteng is open, but we’re holding back to ensure our capacity can grow with the demand. The mill can currently produce 3 500t a year,” Terblanche says. 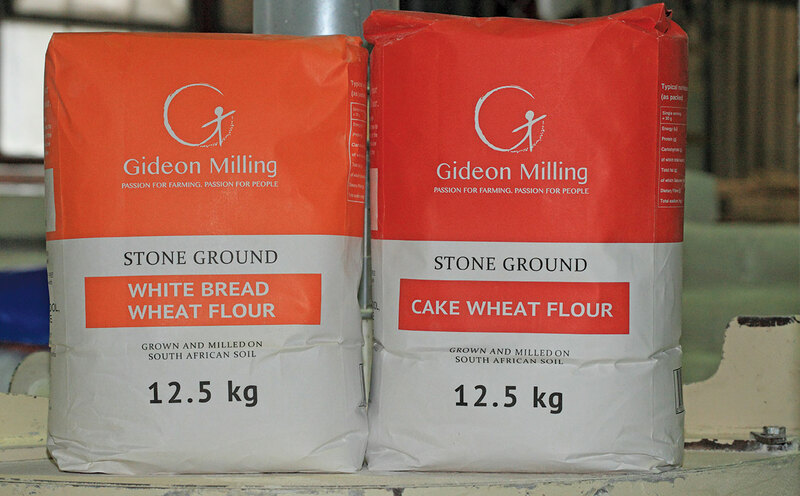 In an attempt to keep its flour affordable, Gideon Mill’s prices have remained unchanged for the past three years. As the company has high overheads due to its small size, the price is between R2/ kg and R3/kg higher than that of the big flour companies. “It has been an extremely bumpy ride so far. Our farmers have suffered three seasons of drought and the market has hit its highest and lowest prices during the decade since we started the company. Gideon Milling flour is sold at Shoprite and Checkers stores, artisanal bakeries and coffee shops across the Western Cape. “Our shareholder, Johan Orffer, uses Safex to help buffer the impact of these price fluctuations, but there’s not much you can do when you’re exposed to international price fluctuations,” Terblanche says. The company has not paid dividends to shareholders yet, but suppliers are paid market-related Safex prices and a small premium. The mill and farms are run as independent businesses. Terblanche is optimistic about the future, and Schreuder, as a producer, concurs. “As a wheat farmer, I realised a while ago that I’d have to become more involved in the value chain if I wanted to break out of this cost squeeze and gain more control over the price I get for my produce. Gideon Milling has presented that break. well positioned to fulfil our dream of supplying the country with good-quality, healthy flour,” he says. Email Aubrey Terblanche at [email protected].